We were privileged to create an installation and audio exploration of stories of Birth in refugee camps. The piece was commissioned as part of the B!rth Festival, at the Royal Exchange, Manchester. 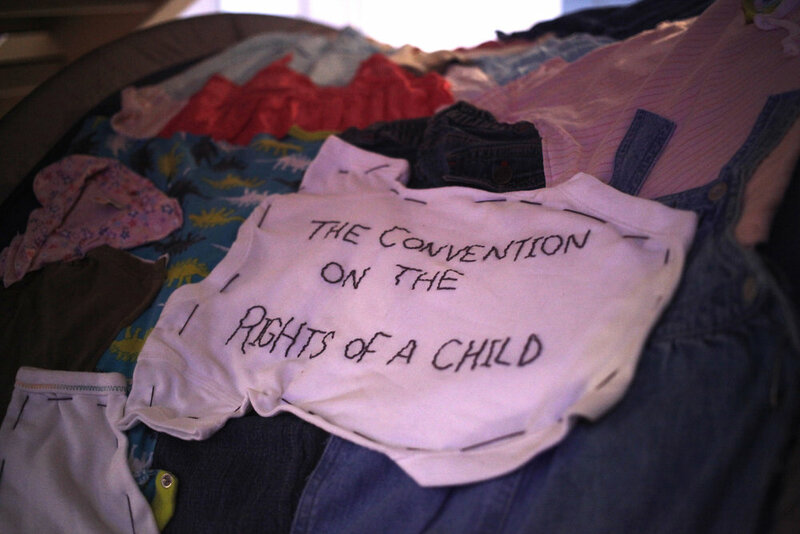 We transformed a tent into an installation, working with textile artist Laura Faithfull, who designed the outer panels around the UN Convention on the Rights of the Child. We approached 14 writers to respond to the direct stories and research we had collated, both through our own time volunteering within camps in Calais and Dunkirk, and also from interviews and stories from other volunteers. We were keen to explore statelessness in refugee camps and the stories of mothers who have given birth. Rebekah Harrison, Ian Kershaw, Lindsay Williams, Louise Wallwein, Furquan Akhtar, Andrew Barry, Sarah McDonald-Hughes, Cathy Crabb, Jenny Platt, Rupert Hill, Victoria Brazier, Sandra Cole, Lisa Holdsworth, Zoe Iqbal. Maxine Peake, Sandra Cole, Louise Wallwein, Cathy Crabb, Zoe Iqbal, Victoria Brazier, Jenny Platt, Ruper Hill, Matilda Hill, Shobna Gulati, Julie Hesmondhalgh, Sarah McDonald-Hughes, Caleb Potter, Lisa Holdsworth, Alan Williams, members of the Royal Exchange World Wide Workshop. The installation is available for display. Please get in touch if you would like to chat with us about it.